380 Series fabric is Kimberly-Clarks newest film barrier fabric, offering great performance at a competitive price. At 3.2 ounces per square yard, its about half the weight of the popular high-performance NOAH fabric. The three-layer construction uses inner and outer layers of spunbond, sandwiching a middle layer protective film barrier. The film barrier has microscopic holes, smaller than droplets of water (and most dust particles), to stop moisture but still allow any moisture vapor or heat to easily escape from under the cover. Technalon car covers, made with Kimberly-Clarks (K-C) Evolution fabric, provide an excellent protection value in all weather conditions. Often imitated, but never equaled, U.S.-made Evolution fabric car covers are used by millions of car enthusiasts around the world. Evolution has the highest UPF rating to provide maximum protection against damaging UV rays. Protecting your paint and interior helps maintain the vehicle's value. Polypropylene fibers are bonded into a durable 4-layer non-woven finish that includes a soft bi-component inner layer of polyethylene and polypropylene fibers. Our Most Popular All-Weather Car Cover Fabric Ding protection, dust protection, highest UV protection of K-C fabrics and good moisture resistance - all at a reasonable price for this outdoor fabric. Maximum UV Protection Highest UPF rating of all K-C fabrics. Soft-to-Paint Inner Layer Bi-component technology blends polyethylene for softness and polypropylene for strength to assure gentle protection for paint finishes (inner layer is gray). 4-Layer Barrier Protects against bird droppings, tree sap and industrial pollutants. Dust / Pollution Barrier Two middle layers of melt-blown fibers act as a filtration barrier against most airborne pollutants. Dries Easily Moisture is not absorbed by the fabric fibers. Breathable Allows any moisture or heat under the cover to easily escape. Impact Absorption 4-layer thickness absorbs impacts to help protect the finish from nicks, dings, dents and scratches. 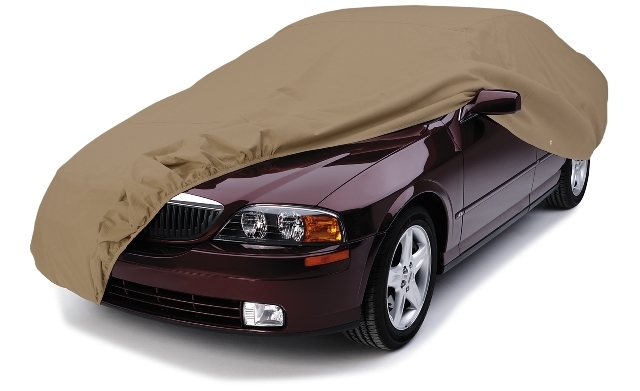 Covercraft Ready Fit Universal Car Covers Standard Ready-Fit Covers Block-It 200 Series Car Covers Block-It 200 Series fabric uses 3-layer polypropylene construction for moisture and dust resistance, and the fabrics are treated for extra UV resistance. Standard covers can be used outdoors on a limited basis against moisture, but because the fabric is breathable, any moisture or condensation can easily evaporate. They make excellent dust covers for indoor storage and the extra UV resistance in the fabric assures good service when used outdoors. Two (2) Year Limited Warranty - Against defects in workmanship and/or the fabric becoming unserviceable during normal use. Covercraft will repair or replace after required factory inspection. Sizes for cars, vans, pickups, SUV's and station wagons. Material color - gray. Deluxe Ready-Fit Covers Block-It 380 Series 380 Series Car Cover fabric is Kimberly-Clark's newest film barrier fabric, offering great performance at a competitive price. At 3.2 ounces per square yard, it's about half the weight of the popular high-performance NOAH fabric. The three-layer construction uses inner and outer layers of spunbond, sandwiching a middle layer protective film barrier. The film barrier has microscopic holes, smaller than droplets of water (and most dust particles) to stop moisture, but still allow any moisture vapor or heat to easily escape from under the cover. Easy To Use - Won't shrink or stretch and retains its tailored shape. Sizes for cars, vans, pickups, SUV's and station wagons. Material color - taupe. Technalon covers (made with Block-It Evolution fabric) feature 4-layer polypropylene construction for maximum protection in all weather conditions. Often imitated, but never equaled, this U.S. made fabric is used by millions of satisfied car enthusiasts around the world. Breathable - Dries quickly because air can easily circulate through the fabric. Dust / Pollution Barrier - The two middle layers of Evolution fabric act as a filtration barrier against most airborne pollutants as small as 0.1 microns (smaller than talc). Easy To Use - Since the fabric is breathable, it doesn't trap air and "parachute" during installation and removal. It also won't shrink or stretch and retains its tailored shape. Four (4) Year Limited Warranty - Against defects in workmanship and/or the fabric becoming unserviceable during normal use. Covercraft will repair or replace, to the original purchaser, after required inspection. Sizes for cars, vans, pickups, SUV's and station wagons. Material color - tan. Ready-Fit covers could actually be called "semi-custom" since they are designed to provide a very good fit using incremental sizing and a hatchback silhouette. While any of our almost 55,000 custom-patterned covers can be purchased by special order, you'll find Ready-Fit covers readily available at most automotive retailers, in up to four different levels of protection. Our semi-custom program uses Block-It Series non-woven protection fabrics made by Kimberly-Clark in the U.S.A. The Budget cover uses single layer Block-It 100 Series fabric to provide good, basic protection at an affordable price. For extended outdoor use our popular Technalon cover, made with Evolution fabric will provide all-weather protection. The 200 and 380 Series fabric covers offer different levels of protection to fit your needs and budget. Don't take the risk.. Kimberly-Clark, our longtime fabric technology partner, recently completed weather testing some of the "bargain priced" non-woven type car covers currently available in the market...the results were shocking! Kimberly-Clark pioneered the technology used to construct non-woven fabrics. Polypropylene (and other) fibers are extruded and then bonded together using special laminates and/or heat and pressure. Depending on the application, the fibers may be bi-component (using two different performance synthetics) and/or multi-layered for dust, ding or moisture control. For the fabrics K-C developed for car cover use, one of the key requirements is the fabric's ability to stand up to UV degradation. You are buying a cover to protect BOTH the exterior and interior of the vehicle and, if the cover won't hold up to the daily onslaught of UV rays, you've wasted money and can end up damaging the car you wanted to protect. K-C's development scientists constantly monitor fabric performance of their own, and competitors', fabrics using "real-life" fence tests where fabrics are affixed to panels and left outside 24/7 in the Florida sun. This is done in addition to weatherometer testing conducted in controlled lab conditions. Both fabric tests rely on control samples for comparing results and performance evaluations, which are usually reviewed on a quarterly basis. Shown above are test results of two "bargain priced" non-woven covers - in only 3 months the UV rays had burned through the outer layer and were cooking the inner layer(s) which will result in minimal life for these covers. In each fabric picture shown above, the fabric to the right of the black divider line is the original (control) fabric and the fabric on the left side shows the results of UV degradation. Not only was the outer layer of the fabric almost burned away by the sun, the tensile strength was reduced by an average of 80%. One of the most expensive components in non-woven fabric construction is the use of UV inhibitors. All Kimberly-Clark fabrics are U.S. made and include a mandatory amount of inhibitors to assure optimum fabric performance. Depending on fabric construction, K-C covers carry a warranty to the original purchaser of up to 4 years. For a cover to last, the fabric has to be built right from the start! Quality Components = Quality Covers...don't take the risk with inferior grades of fabrics when it comes to protecting your vehicle.